In defense of Nancy Botwin – CRITICULT – Telling you what to think since 2003. NOTE: This commentary contains spoilers up to and including the series finale, proceed with caution if you are not caught up on the series and intend to do so. I recently finished watching the 8th and final season of the Showtime series, Weeds, created by Jenji Kohan. I am aware that a lot of viewers gave up on the show around the middle of its run. I was not one of those viewers and have enjoyed the series from the beginning. My reasons for never jumping ship are pretty simple, I like the characters. None more so than the unstoppable drug dealing force of nature Nancy Botwin. When the series began, Nancy Botwin, portrayed by the criminally underrated Mary Louise Parker, was a small time pot dealer in the California suburb of Agrestic. Her husband, Judah, had died a few months before and to keep her children, Silas and Shane, in the lifestyle they had grown accustomed to she saw drug dealing as a viable means of income. From the beginning we were also introduced to a varied cast of characters, most of which fell by the wayside when Agrestic burned to the ground at the end of season 3. Not coincidentally that is when most viewers say the show changed. But go back to those beginning episodes and you can see that while the show is billed as a comedy there was a lot of drama in the mix as well. I think what ultimately drove viewers from the show was the realization that Nancy Botwin was not a hero at all, she was an antihero. She could rationalize everything she did, and by the time the show was over her transgressions were quite extensive, to protect her family and to an even greater extent, herself. But as the show went on it is revealed that Nancy had always been a person that stirs up chaos. The revelation made sense and solved one of the primary questions in the series: What kind of person would turn to dealing drugs to make ends meet when their spouse dies? The eight seasons of Weeds are a long and rambling road trip that sees the Botwins embroiled with Mexican gangsters, federal agents, human trafficking, murder, arms dealing, an extended sojourn to Amsterdam, and prison. But the story didn’t end there, because Nancy Botwin refuses to accept defeat. The reason she is so compelling is because no matter how bad things get, she never stops looking for the way out. It is a testament to Mary Louise Parker’s stunning portrayal of Nancy that even as you hate what she is doing, you still understand why she is doing it. She is not an evil person necessarily but she has to be in control and it’s because of that unyielding part of her nature that she drags her family along for the ride whether they want to go or not. 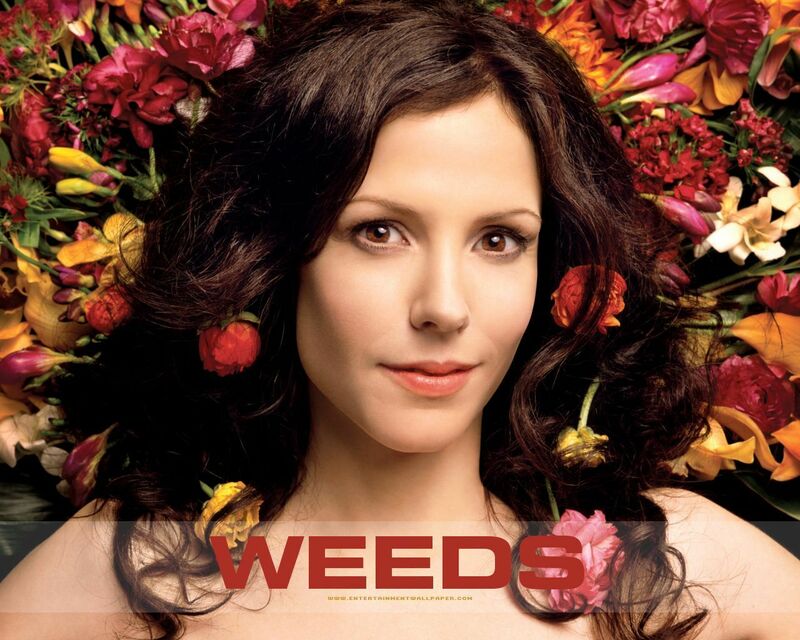 The marketing images for Weeds have always played up the sexiness and downplayed the dark subject matter. Yes, it’s a comedy but it’s a pitch black one. Nancy uses everyone and everything she can to stay one step ahead of disaster. This includes her family, none more so than Andy, her brother-in-law played by Justin Kirk. In fact it is Andy who is the source of much of the comedy on the show. His glib one liners and wacky adventures lighten the tone considerably. As the show went on Andy became more of a parent to Silas and Shane than Nancy who was usually off doing her own thing. Over and over Nancy neglects her family to do what she sees as the “right” thing no matter how morally questionable it may be. As the series wore on the central question of the show became can Nancy be redeemed? It cannot be said enough that the show wouldn’t have been nearly as compelling without Mary Louise Parker in the central role. Nancy is an enormously perceptive character and more intelligent than her adversaries give her credit for. She has no trouble trading her sexuality for what she needs and can rationalize anything to survive. She uses her beauty, especially those big brown eyes and mischievous grin, to get what she wants. Nancy IS the bad guy on Weeds but like Tony Soprano or The Shield‘s Vic Mackey you still want her to succeed. Where people get Weeds wrong is in thinking that Nancy became a bad person. That couldn’t be further from the truth; Nancy was always “bad”. That doesn’t mean she’s not likable but she is definitely morally questionable. At the end of the stunning season 6 finale, Nancy Botwin is out of places to run. She is being marched out of an airport by the Mexican gangsters she has betrayed and it looks like this is finally the end. Then we learn Nancy’s plan C. For one of the few times on the show the viewer is not privy to her plan until it is unfolding. In fact, we don’t even know if she has a plan. We only know that she put her family on a plane to escape her and she seems to be going willingly to her own death. Until we learn that’s not the case, that once again she is defying death and certain doom. That Nancy had one last desperate escape planned. For the first and only time on the series the episode ends on a freeze frame locked on a close up of Nancy looking right at the camera. It is a striking image. In those few seconds the image stays on-screen we see she is steely eyed, determined, and more importantly, unapologetic. She is heading to jail, but it was the only gambit she had to escape certain death. She had done what she had to do to protect her family and she took the consequences for a murder that she didn’t commit. If the series had ended there it would have been a fitting conclusion. The final episode isn’t as striking as some of the episodes preceding it but it still is a good ending. The last few minutes ends quietly with the five main characters walking outside to sit with Nancy. Before that we have one more heart to heart between Andy and Nancy, the relationship that has always been the show’s emotional center. In that conversation Andy tells Nancy that her work is done. She raised the boys, she saved Andy when he needed it, that he loves her, but he can’t be around her any more. She’s just too toxic. Although Nancy resorts to bribery and cajoling this time she doesn’t get her way. She is going to be alone, but there is the hope that it will still be ok. She is incredibly wealthy but her relationship with her family has been shattered. Before the rest of the characters join her we see Nancy sitting alone looking toward the camera, no doubt wondering what she is going to do now. It’s a fitting ending for one of the most multifaceted characters on TV. She doesn’t die but nor was she truly redeemed. Even in the end she stayed true to her own selfish nature and paid the price. As a series Weeds had its ups and downs, but Nancy Botwin deserves her spot as one of the great television characters of all time. Available on Netflix on Demand. Pingback: GLOW (2017) – Season 1 – CRITICULT – Telling you what to think since 2003.